Roofs of complex shape attract particular attention to the architecture of the building. 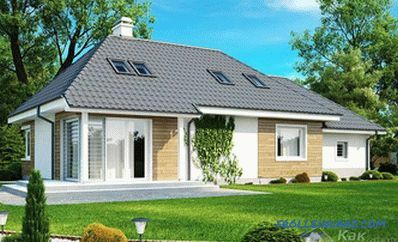 Four-pitched roofs are popular in the construction of country houses. Four slopes, located in different planes, give the house a respectable appearance. Most often, the slopes are made of different shapes: two of them are obtained triangular and act as gables, two have the shape of a trapezoid. the space under the roof can be used for the attic. Hip - a classic version with two triangular hips and two slopes in the form of a trapezium. Half-hinged - triangular slopes have a shortened shape, this design is carried out for the attic equipment. Shatrovaya - has the shape of a pyramid with triangular slopes. Suitable for square building. Tilt angle for Skates are selected on the basis of recommendations of manufacturers of roofing material and natural features. 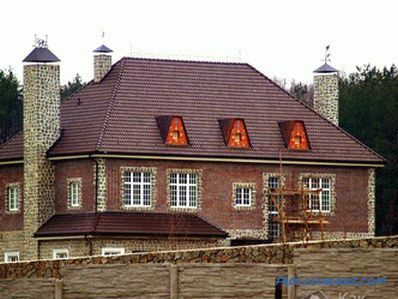 For a soft roll roof, an angle of up to 18 degrees is sufficient, an angle of 15-60 degrees is suitable for slate, and a slope of 30 to 60 degrees should be laid under the shingles. The amount of precipitation is of great importance in winter; if a significant amount of snow falls, it is better to choose steep slopes, on which rainfall is less delayed. 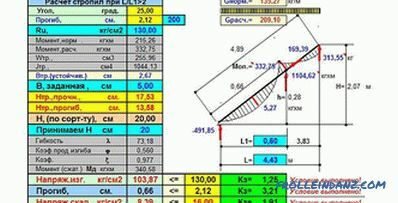 By selecting the angle, you can calculate the height ridge and other parameters necessary for the construction of hip roof. To calculate the area, geometric formulas are used for the triangle and trapezium. 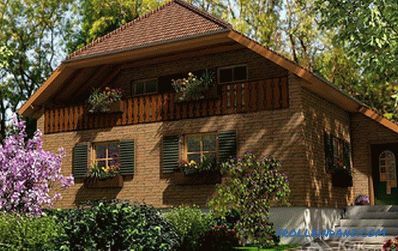 In addition to the loaded loads, the roof of the house should have a safety margin that guarantees the stability of the structure in an unforeseen situation. 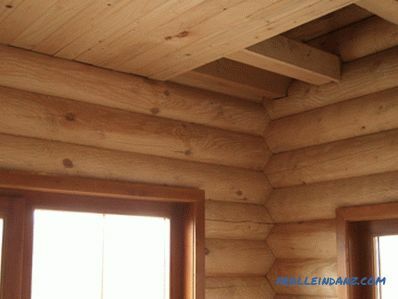 For the construction of the truss system used timber and planks. If there is a need to strengthen the elements, the boards are doubled. Before starting, all sawn timber is treated with an antiseptic. Installing the roof begins with securing the carrier grounds - mauerlat. This is a timber section of 150 * 150 mm, which is laid around the perimeter of the walls. Its placement is horizontally controlled by level. The beam should not be located on the edge of the wall, it is necessary to leave a distance of 5-7 cm. The mounting of the mauerlat is carried out on studs immured into the masonry, which are tightened with nuts. This beam allows you to link the truss system and the walls of the house in a common structure. In order to install the uprights, the floor or the floor beams are necessary. 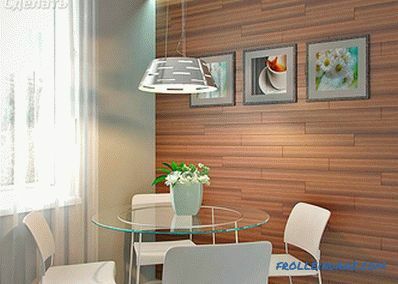 These elements are made of bars with a size of 100 * 200 mm or twin boards. All supports are installed strictly vertically and attached to the bench with a metal angle or plate. For hip roof racks are installed in one line, mounted on the ridge girder. When building a tent roof type, the supports are placed diagonally, equal distances from the corner are laid. As a result, they form a rectangle on which the runs are stacked. Fastening is performed by corners. The side rafters are installed after machining according to the pattern. A thin board is taken as a blank, applied to the girder and marked with gash. The second end rests on the mauerlat and the lower gash is planned. The required amount of rafters is prepared according to the template and installed with the chosen fastening step, it can be from 60 cm to 1 meter. With the run and the basis of the connection occurs with brackets or screws. 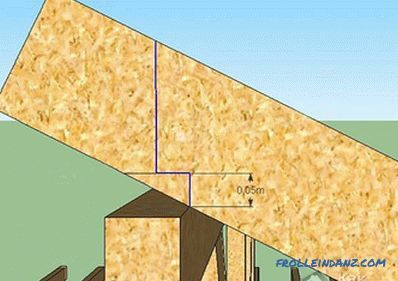 Slanted rafters with ridge girder form the angle of inclination of the slopes. 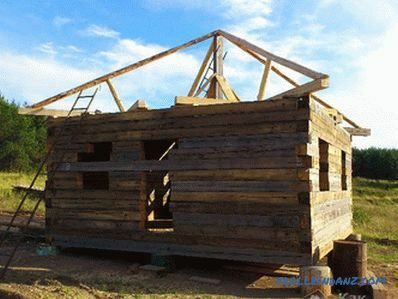 These rafters are located diagonally and carry additional load, so they use double boards.He washed down the rafters according to a template, their length takes into account the overhang of 50 cm. In the upper part, the rafter rafters are connected by a bolt to give strength. 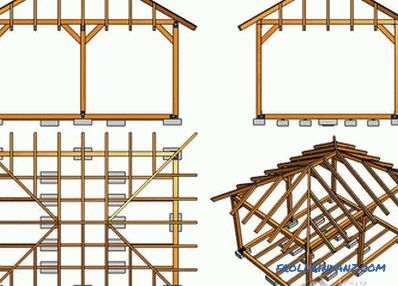 When constructing a hip roof, mow rafters are connected to the ridge assembly with the help of puffs. The rafters are installed at an angle of 90 degrees and are sure to connect to the walls with wire clamps. 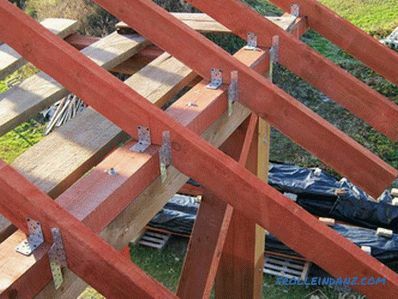 Short rafters or planners are attached to diagonal rafters. They are performed in different lengths, but must be parallel to each other. Narodniki along with ordinary rafters form the side slopes. For the tent model, the installation of scammers and the fixing of pillars, struts and sprengels is also the final stage of construction. To relieve the load from the diagonal rafters, under them installed sprengeli. These are vertical supports that rest on the rods. Side rafters are fixed with struts. One of the horses of the board rests on the bed, and the second is cut at 45 degrees and attached to the truss leg. 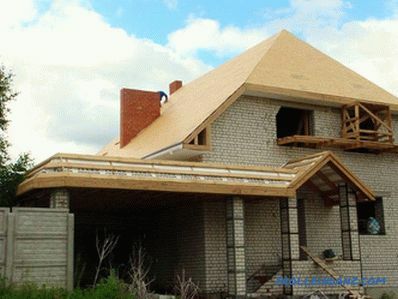 Complete the construction of the roof Allow it to warm with basalt wool or polystyrene foam. The material is placed between the rafters. Protection of the roof from moisture will provide a waterproofing layer. The dimensions of the lathing depend on the type of roofing, on the hip type the soft tile looks attractive, it requires a solid lathing. 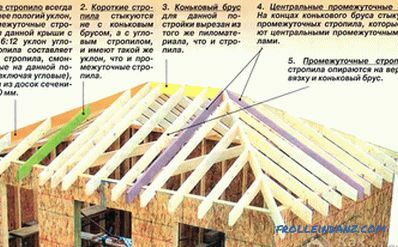 Proper construction will help viewing the video, explaining the nuances of installing rafters.